My name is Matt Winick from Ann Arbor, Michigan with a strong interest in learning history including social justice. In these subjects, I like to learn the need for Civil Rights to be strong to reduce discrimination, protect the environment from pollution, have immigration reform to protect immigrants including refugees from oppression, and many others. Mayor Garcetti, the main reason I’m writing you a letter to explain how I find your work as 42nd Mayor of Los Angeles to be very inspiring to me, give you my story called the Kid With No Words about my life with a disability where I dedicate you for inspiring me, and to share with you my visit to Los Angeles. In your current role as 42nd Mayor of Los Angeles, California I like on how you are a strong supporter of Civil Rights by advocating for people with disabilities’ rights, pushing for funds to help women including minorities businesses to help them compete in the economy, expressing the need to improve equal pay for women. Another thing on Civil Rights I really appreciate on how you are working with law enforcement including minorities communities to find ways to reduce racial profiling and working with law enforcement to combat against hate-crime. Expanding job-training programs to help train youth including workers to develop job-skills to develop work skills in order to prepare them for the economy, expressing the need to raise the minimum wage to help provide minimum wage workers with money to assist them to afford, and encouraging businesses including industries to hire women, minorities, and people with disabilities to work for them are great ways to improve the economy. On social justice, I really appreciate on how you are pushing for the need for body cameras on police officer to help reduce police abusing their power, support expand protection laws to help protect immigrants including refugees from being oppressed, and implement programs to help drug-users get the care they need. To protect the environment, I liked on how you are a continuous supporter of funding renewable energy projects to help reduce addiction to oil with gas, push to re-fix the metro rail stations to help people get to places while reduce co2 emissions, and work to improve city services to help clean up trash including liter in communities. I really like your approach to improve education by funding special education to help students with disabilities get educational resources they need, expanding after school programs along with recreational programs to help youth get help on assignments from tutors or keep them off from joining gangs, providing more programs in diversity along with the arts to make education diverse or help emphasize the need for diversity. Another thing that I like about your work as mayor of Los Angeles is how you are a continuous supporter of expanding funds to help preserve or restore historical sites including attractions to help improve tourism while make learning a better place for people, support funding to improve homeless services to help take care of people who are homeless along with provide jobs to hire them to clean the city, and work on improving with fixing the LA Metro station to help people including tourist travel to different parts of L.A. while reduce car accidents. 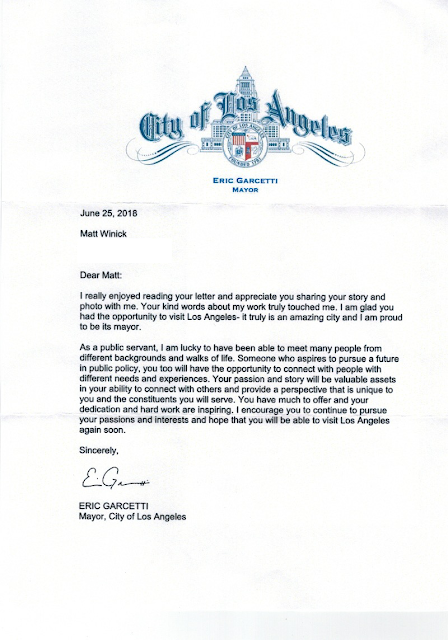 Mayor Garcetti, I have autism with a learning disability. Having a disability is hard for me because I have trouble comprehending on learning different subjects, sometimes I struggle to communicate my thoughts, and get teased. Your commitment to be a strong supporter of Civil Rights including people with disabilities’ rights really inspires me to work hard on my disability. In a few times I have visited Los Angeles and I enjoyed visiting Chinatown, Chinese American Museum, The Getty art museum, Koreatown, Madame Tussauds Hollywood, walk around the Hollywood district, and Venice Beach. The main reason I had fun visiting these attractions and museum because it did a great job educating me about Asian American culture with history, the staff who worked at these places helped accommodate my disability with answering my questions, learn the history of Hollywood, and enjoy seeing a lot of diversity. Also your role as current mayor of Los Angeles, California motivates me to continue my strong interest in learning history with public policy. My future goals is to continue to explore Los Angeles to see more sites including historical sites, and to someday work in history or in public policy to help emphasize the need to make Civil Rights stronger, have diversity, protect the environment, have immigration reform, and many others. I strongly believe that you are making a great difference in your current role. I’m very proud on how you are working hard to make society, diversity, and Civil Rights a better place. You have inspired me to work hard on my disability, be interested in visiting L.A., and be motivated to continue to learn history including public policy. I was wondering if you could please give me some advice about working hard on a disability. Thanks for taking the time to read my letter, working hard to make a great difference, and inspiring me. I wish you well to continue to make a great impact on society.